This DVD is for any one who wishes to understand and ride classical gymnastic movement in lightness and without stress on the horse. The exercises presented in this DVD allow the many riders who do not study dressage access to gymnastic improvement for their horse. From the early groundwork and on into riding exercises, this DVD clearly explains how to create supple and strong horses. 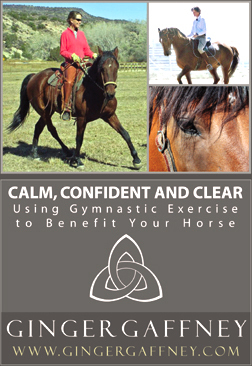 The DVD covers many exercises from the ground and in saddle to help horses advance their individual athletic abilities. 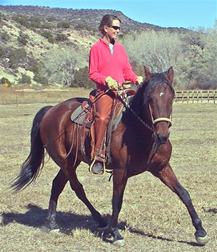 Ginger uses her approach of “French Natural” horsemanship to educate both riders and horses using classical gymnastic techniques. "Studying the French classical approach redefined lightness for me. Lightness is something that flows through the entire body of the horse, reaching a potential I could have hardly dreamed before. Through the early work with young horses, starting them without stress and with a great deal of understanding, I introduce the classical exercises taught to me by a few great horse men and women, who were former students of Mr. Oliveira. In this early work, I blend together both my natural understanding of the horse with the understanding of how to prepare a horse to polish its natural balance through classical exercises. This is now the basis for my entire program and how I advance horses both mentally and physically."